Here's an interesting insect from the summer of 2015 -- a big wasp I passed on a hot day in August. 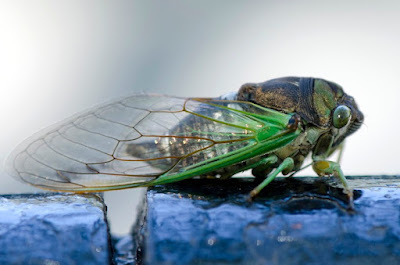 It's Specius specious, commonly called the eastern cicada killer or cicada hawk. 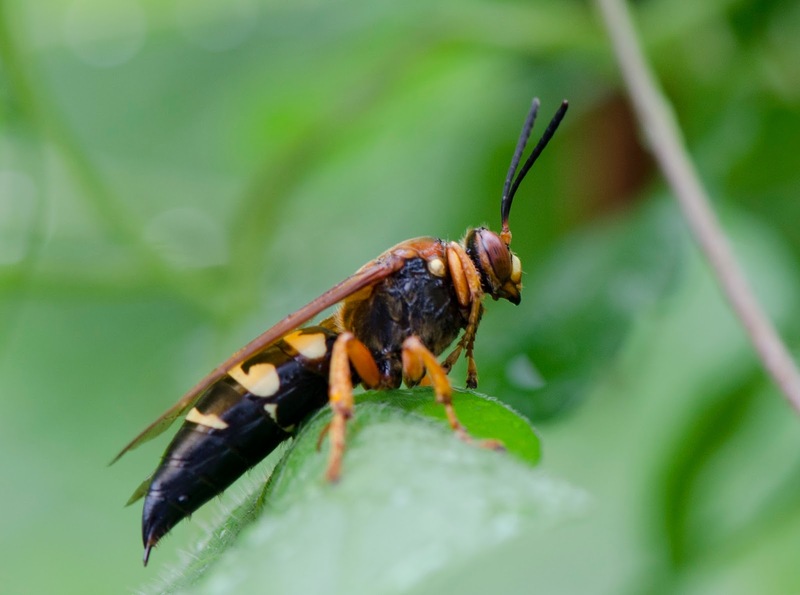 At about an inch and a half long, the cicada killer is one of our larges wasps. Their huge size makes them look dangerous, but they are usually not aggressive and do not often sting us. They are solitary wasps that live alone; they lack the hive-defending sting-whatever-comes-close attitude of the yellowjackets they are sometimes mistaken for. I saw this cicada the same day. It is also a really big insect, up to about two inches long. Click on the photos to enlarge. It was not accident that I saw both of these on the same day; they are intimately associated. When a female cicada killer is ready to lay eggs she digs a nest in the ground. (Lawns, planting beds, and the edges of concrete slabs are favorite sites.) Then she goes out hunting cicadas. She stings a cicada to paralyze it and then carries to her nest. The flight is laborious because the cicada is so big and heavy. The wasp will sometimes land along the way or stop to rest, holding onto the prey. Back at the nest, she pushes the cicada in and may go back to find more. After the nest is provisioned to her satisfaction she lays eggs on the paralyzed prey and seals the nest. The eggs hatch into larvae that eat the fresh cicadas. Then, plump and satisfied, the larvae become pupae and spend the winter underground. 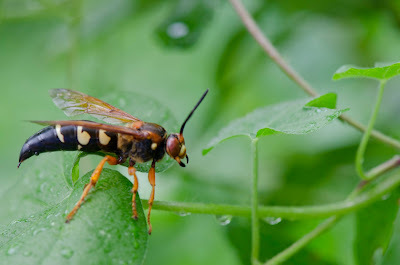 They emerge from the nest the following summer, digging upward, and fly about eating flower nectar and plant sap until the time comes to breed, and hunt cicadas. Check out how this wasp is resting with its front legs folded up to its shoulders. Maybe wasps do that all the time and I never noticed until I watched a giant.